Over time, grime and dirt build up on your upholstery just from daily usage. At Sun Dry we are experienced, reliable & professional in every service that we offer including cleaning upholstery, fabric & leather lounge suites to the highest quality, for the best price. We have very effective enzyme-based chemicals that we apply during the cleaning stage that dissolves this protein based stain that generally builds up on arm rests and cushion seats of your furniture. Our technicians can apply fabric protector on the upholstery to increase the resistance of further soiling. 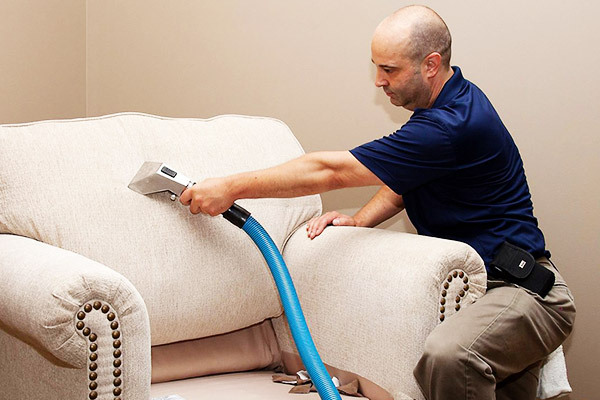 Our technicians apply these chemicals and steam clean the upholstery to remove and rinse. We clean all types of upholstery & leather. Our team of professional cleaners will firstly pre-inspect your upholstery, performing a colour-fastness test to ensure it is safe to clean. They will then treat your fabric using our cleaning solutions to remove the build up of oil & soils. We then apply a specialised upholstery cleaning spray that will enable the removal of the dirt & soils during the cleaning process. This pre-spray is designed also remove fungi, germs & bacteria during the cleaning process. We then use a hot water extraction cleaning system to rinse the fabric & extract the dirt, soils & oils from the fabric. Highly qualified, experienced technicians with the knowledge to safely & effectively clean the most difficult of fabrics. Solvent-based cleaning solutions remove more oils & grime than conventional cleaning systems. Sun Dry provides you with the best quality leather cleaning service. Our cleaning process uses leather cleansers which are applied to remove all soiling from the surface of your leather suite. Another part of the service involves using a specialised product that both nourishes & protects your leather sofa from the wear & tear of everyday usage. We are more than happy to offer you our leather cleaning services in all areas that we provide our carpet cleaning, pest control & vinyl cleaning services; maybe you have a need for more than one of these services, get in touch with us; as special offers are available from time to time. Having your leather sofas professionally cleaned will both extend its life & remove any unpleasant odours that build up over time. Here at Sun Dry, we aim to get leather sofas looking br& new again by removing all stains & revitalising them to their original colour. We use all the latest technology & equipment, so you are guaranteed great results, every time. Applying the leather cleaning solution to the leather sofa. Agitating the leather especially the most worn-prone areas – the arms & head rests. then applying a nourishing cream & re-sealing of leather with highest quality leather protection products available. We know that all leather is not all the same, so be sure to employ the services of experts like Sun Dry whenever you need your leather furniture cleaned. All of our team have achieved competency in our extensive training program; this training is ongoing so that our team members are always up to date with the latest processes, procedures & products. When you deal with Sun Dry, you have peace of mind knowing you are dealing with a team of experts.